rec. Salle Olivier Messiaen, Radio France, Paris, 5 December 2001, Théâtre des Champs-Élysées, 5 April 2008 (live), 14 May 2009 (live). 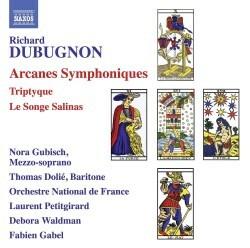 The Swiss-French Richard Dubugnon has a growing reputation as a composer, and, on the evidence of this CD, as well as its companion in the Naxos 21st Century Classics series (Naxos 8.555778), it is easy to hear why. The music is modern in idiom, but with a keen sense of the audience for whom it is written. The two song-cycles here, Triptyque and Le Songe Salinas, each use music at the service of the texts (in both cases by Stéphane Héaume (b. 1971). There is a wonderful clarity to the tests, something not always found in song settings. Tryptique was commissioned by the New Music and Russian Music Restival at the Royal Academy of Music. The three poems have some religious content. The first, Ecce Homo is about a man facing Christ on a cross, then tempted and taken to Purgatory, before surrendering himself to Christ. Déserts concerns the soldier who pierced Christ’s side with a spear, seeks refuge in the desert, has hallucinations, but at last sees Christ on a distant hill. The third piece is about the miserable life of a dwarf, finding peace with his equally unhappy twin in their shared grave. The supporting instrumentation is interesting, a mixture of woodwinds, brass, percussion, celeste and harpsichord – 11 players in all. By contrast, Le Songe Salinas (described by the composer as a short opera) uses a large orchestra with six horns, five clarinets and various unusual instrumentation, including North African percussion instruments. The piece begins with two lovers falling asleep. The woman fears danger for her lover, Salinas, and has dreams about him. In one, he is found hanging in a medieval garden. In the next she dreams of an oasis and she dances with him, rides away for a swim, and returns to find him dead, his hand covered in fish scales. Then she dreams of being with him on a boat, then on a small island, where she stabs him. At last she wakes up, finds Salinas dead and a dagger in her own hand. She calls the guards to take her to the gallows. One is struck by Dubugnon’s gifts of varied textures and ability to capture moods quickly and economically. He describes himself as using flashback and video techniques: the use of repeated motifs is effective in evoking echoes. The Arcanes Symphoniques are immediately attractive pieces of great interest – brief symphonic poems on major arcana from the tarot pack. Dubugnon wanted to compose pieces for all 22 such cards, short impressions of between two and six minutes. These can be played in any order, and the composer says that it was not intended that all should be played together. There are six on this CD (a more complete set of 18 pieces may be heard on Accord 4801435) – it would have been good to hear more. Performances strike me as excellent throughout. It is worth also listening to the companion CD, which includes the Piano Quartet. Notes are informative. Texts are given in French only. This is music to enjoy and love – this is a composer not only to explore but to follow with interest through his remaining career.